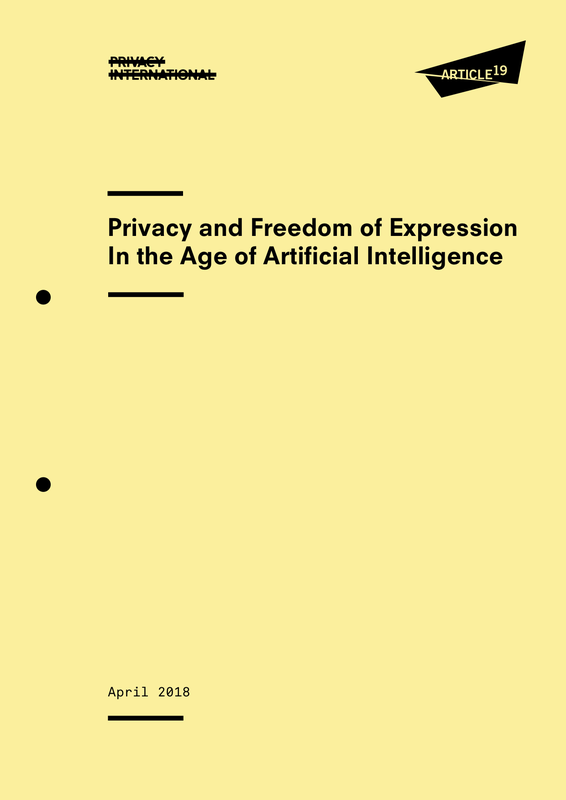 ARTICLE 19 and Privacy International’s report provides an overview of the impact of AI technologies on freedom of expression and privacy. It calls for further study and monitoring of how AI tools impact human rights. Ensure protection of international human rights standards. All AI tools must be subject to laws, regulations, and ethical codes which meet the threshold set by international standards. Ensure accountability and transparency: corporate, technical, and state actors must allow for meaningful multi-stakeholder — including civil society — participation in setting technical standards and regulations for AI systems. Build civil society coalitions and expertise networks to develop knowledge exchange and advance debates on AI on to human rights impacts. Artificial intelligence systems form an increasingly important role in our daily lives, from autocorrecting our text messages to determining our employment opportunities. While these systems can bring about positive changes, their use by states and corporations risk negatively impacting human rights. In particular, AI practices of collecting and sharing data to profile and predict behaviour threaten the rights to privacy and free expression. ARTICLE 19 and Privacy International’s new report examines how one particular AI technique, machine learning, impacts these rights, the implications we can expect, and how these must be addressed. Issues of AI and privacy came under the spotlight again this month when Facebook CEO Mark Zuckerberg testified before the US Congress on issues surrounding the platform’s controversial data sharing and approach to privacy. In both of his testimonies, Zuckerberg presented AI tools as ‘magic bullets’ for resolving complex content and privacy issues. But given that AI tools are at the heart of the company’s controversial data practices, from facial recognition to profiling, this argument is unconvincing, and further demonstrates a worrying trend of corporations and governments advancing AI capabilities with little understanding of the impact such systems may have on people’s lives.